We share a four-step process for how to increase customer survey participation. Why Do You Have Low Survey Responses? Customers currently have a huge level of apathy and survey overload, because everyone’s asking for surveys, everyone’s asking for feedback and everyone is doing it in a very formulaic way. Guy’s assertion that very few organisations are engaging customers with their surveys is reflected in our research, which found that more than half of contact centres have a survey completion rate of less than 10%. This research may reflect that contact centres treat customer feedback as an afterthought, meaning that they ask for surveys to be completed in a generic way. This means that organisations are not gathering the thoughts of the silent majority of the company’s customer base. Yet, the silent majority are the customers who really can help you. Take a look at the graph. The section of your customer base highlighted in the middle section of the graph, are the ones who need to be listened to and engaged with most. 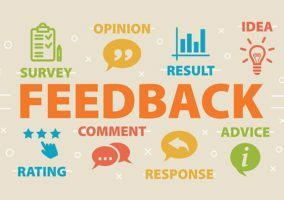 It is all well and good to say make customer feedback a central part of your business processes, but how can you do this? Here is a four-step plan for doing so and, consequently, increasing survey responses from the silent majority. Change the beliefs in either your team or your organisation. Stop looking at your VoC programme as “something that we should do”. Instead, use it as a main business driver. Understand that there is no quick fix. Take Virgin Wines as an example. The reason why they get massive amounts of feedback is because it’s an intrinsic part of the whole business. If you want to improve survey responses, stop looking at the feedback process as an ‘add-on’. 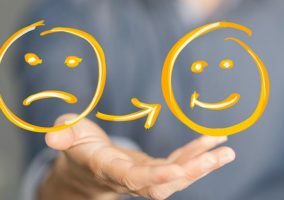 Once you have made the effort to change contact centre attitudes towards feedback, start looking at your current feedback. Think about what your customers are really saying to you, what is between the lines? What emotions are being fed back to you? Open feedback systems differ from “closed feedback” systems that include certain surveys, which ask closed questions. 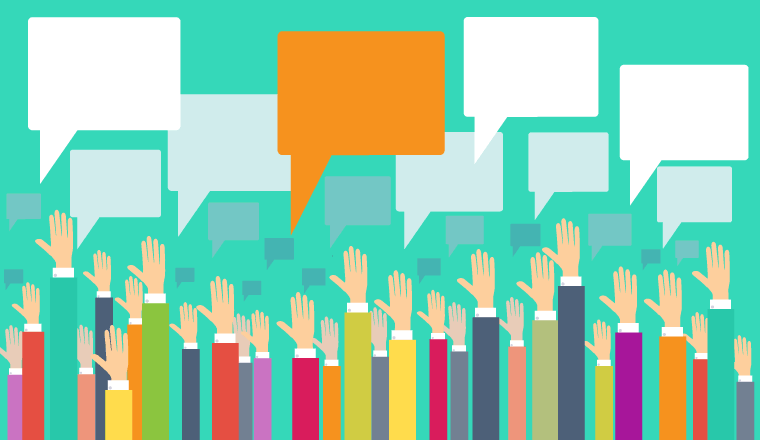 Customer panels are one way to ask open questions to the silent majority. They involve sending annual open surveys to customers who have agreed to be part of the panel. 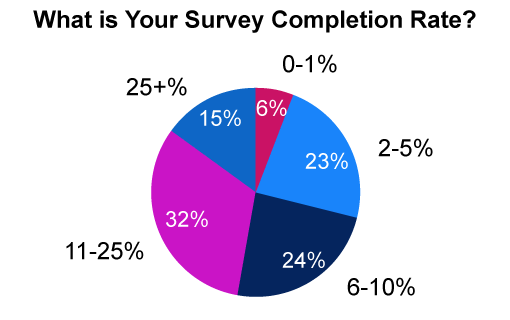 So, now you have your survey responses, how are you going to get the best out of them? Guy’s suggestion here is to respond to the customer in two ways: directly and indirectly. 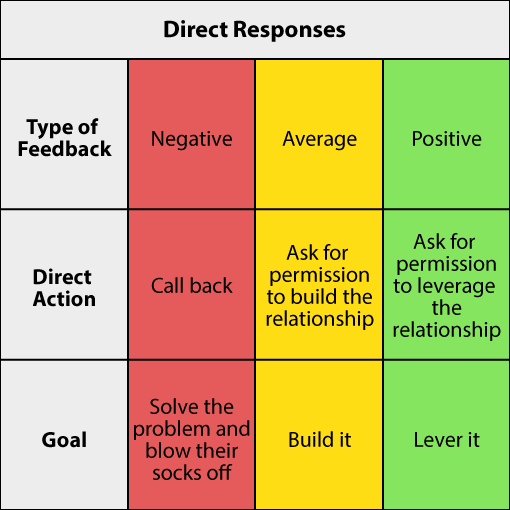 Indirect responses are about having continual feedback systems. As a business, look for learnings that can be taken from the VoC which can be used to continually improve the organisation, at all levels. Take small steps every week. 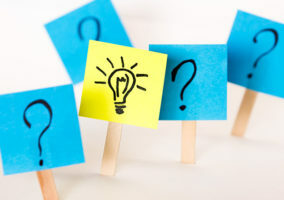 While indirect responses involve informing customers of how your organisation has benefited from their open feedback over time, direct responses involve directly addressing comments that the customer has made in their feedback. As in the graphic above, with customers who leave negative feedback, try to contact them immediately. Solve the problem and attempt to blow their socks off systematically. With customers who leave positive feedback, ask for permission to leverage the relationship and lever it. These customers are great at helping to improve sales through service. 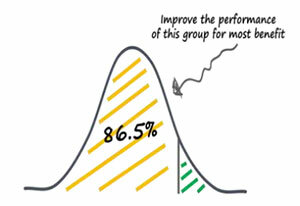 Customers who leave average feedback are likely the most reluctant to give feedback and are usually the silent majority. With these customers it’s important to ask for permission to build the relationship and then building it. Feedback systems have got to be more innovative, exciting and engaging than the bulk standard customer loyalty systems, which are dull and used by everyone else. To do this, Guy says that: “Feedback systems have got to be more innovative, exciting and engaging than the bulk standard customer loyalty systems, which are dull and used by everyone else.” This is where systems like customer panels can work well. What Is the Long-Term Purpose of Listening to Your Customers? So, listening to the customer should be more than checking the quality of what you are doing. Instead, you should listen to customer feedback to continually improve not only the contact centre, but the larger business as well. If the larger business sees the contact centre as a cost centre, then the organisation will look to minimise those costs and contact centre spending at every turn. Therefore, it is becoming increasingly important for the contact centre to showcase its value. To do this, it is advisable to harness customer feedback and demonstrate how it can be used to improve reputations, loyalty and referrals.